Potato Chips packaging really doesn't get much better than this. It has bright and broad shelf friendly branding and colors. The logo and company name seems friendly and modern. The variety is given due prominence. The 0% 'bad things' is even formed as part of the branding. The different varieties have different colors and this flavor stands out particularly well because the color graduates and graduates back again, with creamy colors that evoke thoughts of similarly altering flavors. 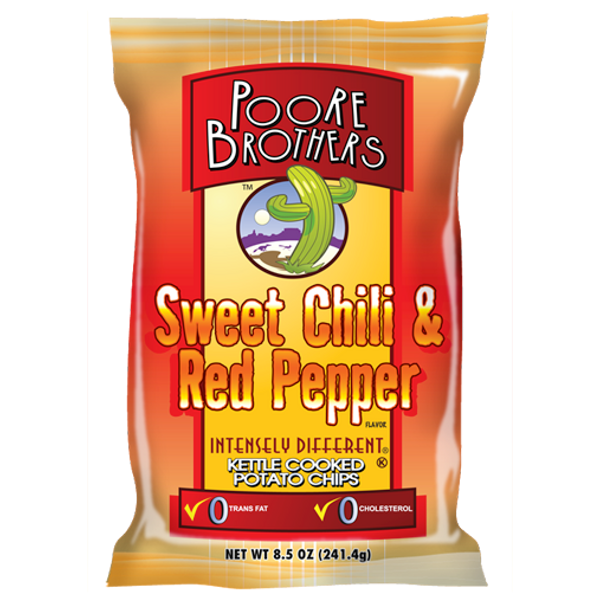 Just the same as all of Poore Brothers Kettle Cooked Chips, these Chips enjoyed a firm, thick and crunch ready texture, despite appearing more thin than some brands. A mouthful felt like a crunchy snack meal, rather than a few Chips. These Kettle Cooked Chips appeared a little less oily than a lot of comparables. There were still oil raised bubbles living on the relatively thin potato slices and there was also seasoning visible. A few different shapes, sizes, curly, folded and some were stuck together. A Nose Plunge test did not reveal much. There was no real Pepper smell. The nutrition label of Poore Brothers Kettle Chips are all a little more scary than the healthier brands of this style of Chip. With 3g of saturated fat per small bag it doesn't leave much room in your daily guidance budget for other indulgent treats. 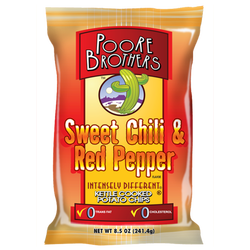 These did however do what it said on the packet - there was a sweetened Chilli pepper flavor with a mildly burned Red Pepper flavor mixed together. A really quite rewarding taste with a subtle heat.